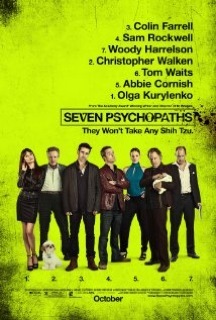 Review: Martin McDonagh shows creativity in “Seven Psychopaths”, as he had already done in 2008's “In Bruges”. Colin Farrell joins him once again, playing an alcoholic screenwriter struggling to get fresh ideas for a movie about psychopaths. This film is nothing more than an insolent mockery about old gangster movies with all those flashy explosions and unexpected shootings. A funny absurdity is present in almost every character and situation. Sam Rockwell, Christopher Walken, Woody Harrelson and Tom Waits, helped to maintain the spirit of craziness alive by playing compellingly some of the psychos, in a movie whose structure may seem confusing at first, to become better defined as the story progresses. “Seven Psychopaths” is violent and sometimes disorderly in its storytelling, but on the other hand, provides constant surprises and some intelligent jokes. An imaginative action-comedy blend.